I’ve Moved! Check me out at simplyrdfoodie.com! Like I discussed in an earlier blog post, I decided to go vegetarian for Lent. Whose first day coincided with Meatless Monday and the third day of National Nutrition Month. Basically, it was an epic day (and week) of veggie goodness. And this week was not as much as a disaster as I thought it was going to be. I ended up eating basically the same thing for dinner each night (something that I vowed not to do) but it worked with the “cleaning out the fridge” mentality that goes along with the business of the week before Spring Break. It is beautiful, simple to make, gluten-free, and full of wonderful healthy things that help you stay healthy and focused as this endless winter goes on and on. This dish really highlights all the food customs I learned during my time abroad in Florence. 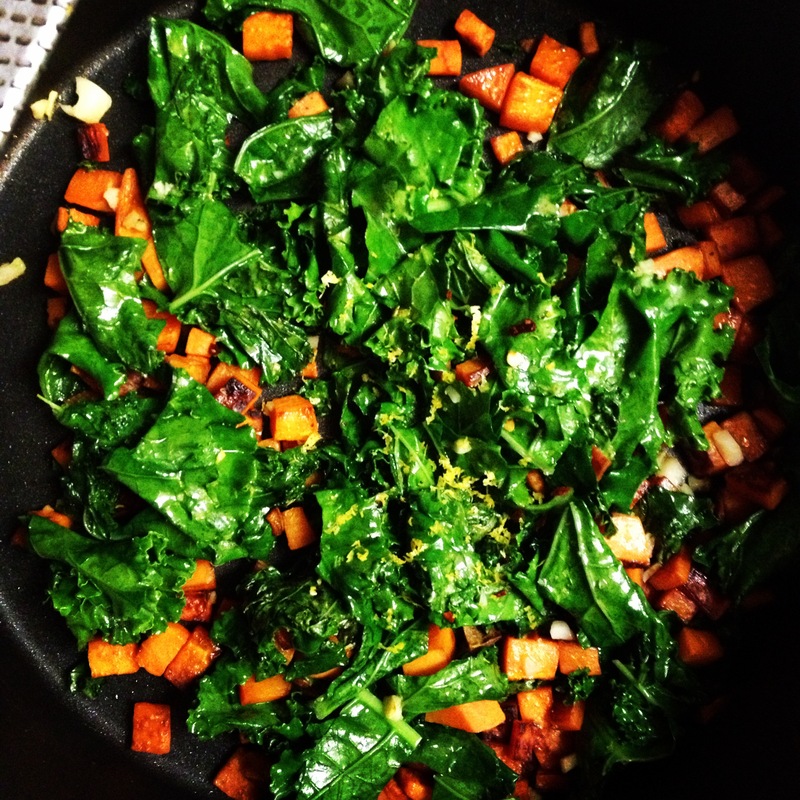 Tuscan kale and sweet potatoes are in season where I am (which also means that they’re cheap!) and provide lots of color and good nutrition to the dish. And nothing says winter more than dried cranberries! Quinoa and white beans provide a basic backdrop that lets everything shine and a lemon vinaigrette brightens the dish and keeps everything fresh. All in all, I shall be making this dinner, vegetarian or not, all the time. It’s perfection. It was a good first week! Now I’m home and I actually will be eating different things each night. Stay tuned for lots of pictures of Mama-made meals! Tell me kiddos – are you going vegetarian for Lent? Or are you just a vegetarian? 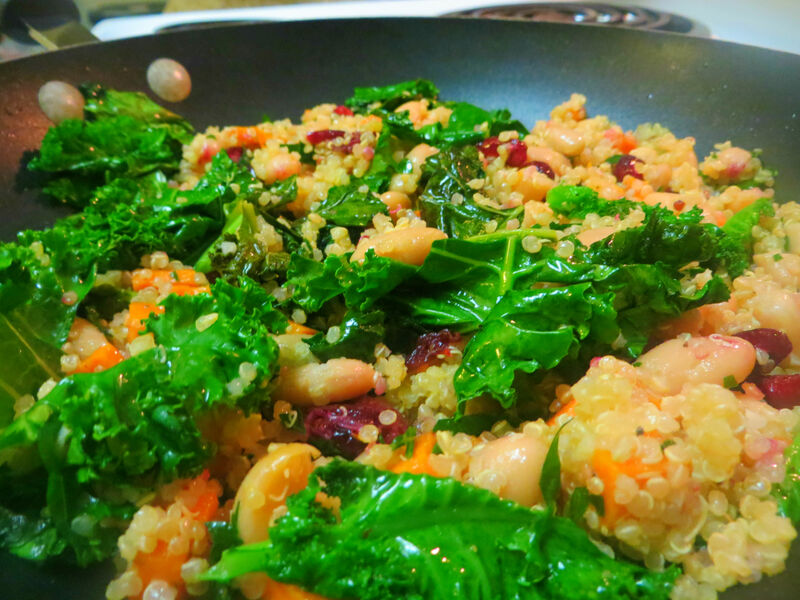 Let me know if you have any favorite meat-free offerings – I would love to try them! 1. Cook quinoa to package directions. Basically: rinse quinoa in fine mesh strainer (those grains are tiny!). Bring 1½ cups of water, vegetable stock, or chicken stock to a boil in a medium pot and add quinoa. Bring back to a boil, cover, and reduce to simmer. Just like rice (why did I struggle with this?)! Cook for 15 minutes or until the liquid is all absorbed and the quinoa is tender. 2. Sautee sweet potatoes in 1 teaspoon of olive oil over medium-high heat until potatoes are soft and golden brown, about 5 minutes. 3. 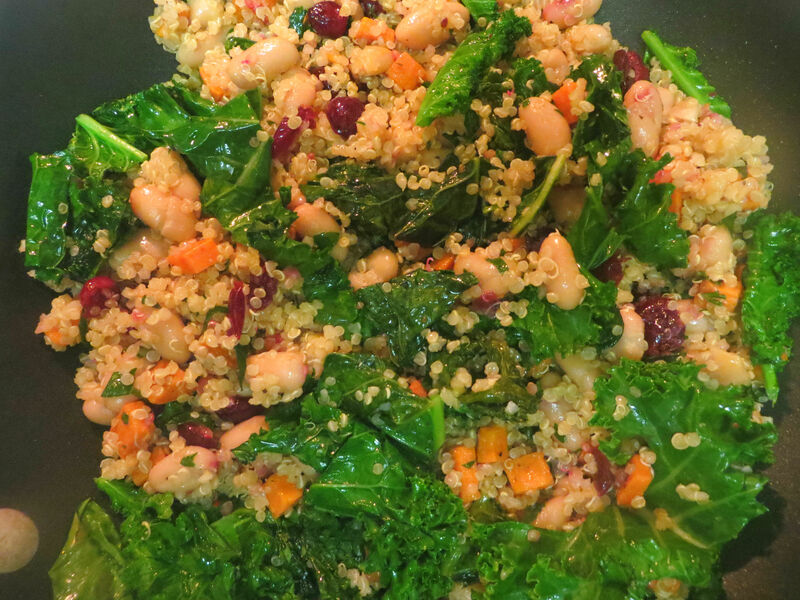 Add kale to sweet potatoes and continue to cook until kale is wilted, 2-3 minutes. 4. Add in garlic, lemon zest, salt, pepper, and red pepper flakes (optional). 5. When the quinoa is cooked, place into a large bowl and add the vinaigrette. 6. 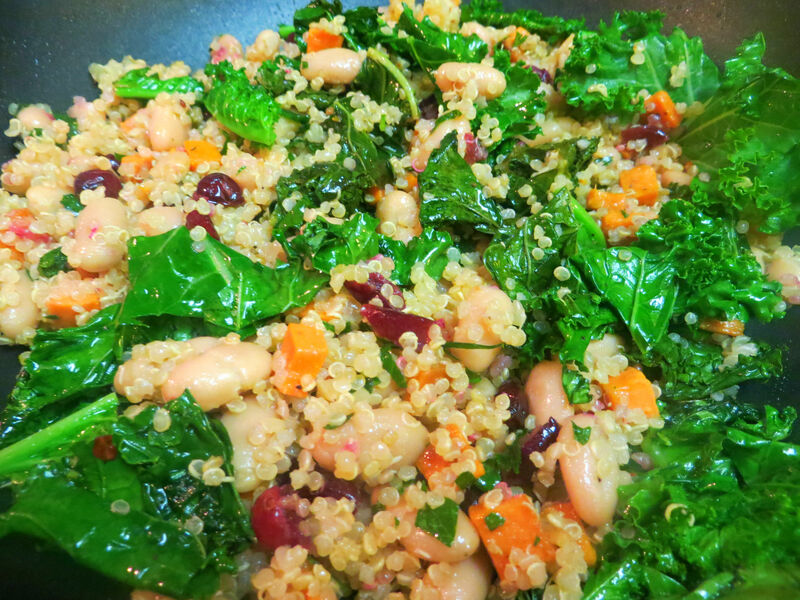 Add kale-sweet potato mixture, cannellini beans, dried cranberries, and parsley to the dressed quinoa. Stir to combine.